Our highest quality disc for professional use. These top of the range discs combine an excellent working life with a very high stock removal rate for economic efficiency. 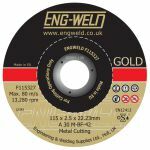 The discs are manufactured to the highest specifications in the EU and are designed to cope with the cutting and grinding of steel and associated materials.